The number of Korean households with only one occupant is on the rise, and local companies are taking increasing notice of their significant purchasing power. Compared with married people, those who live alone tend to eat out in restaurants, enjoy time at cafes, take various hobbyist classes and go to the gym. The demographic’s distinctive preferences for certain goods and services is now generating interest among Korean companies, which sense a big opportunity as the trend seems to grow. “There is a market demand from those who live alone, and companies perceive it as a new consumer trend,” Jang Dae-gyu, spokesperson for Shinsegae Department Store, told The Korea Herald. Shinsegae held a lifestyle product event targeting singles in November, which was far more successful than they expected. Customers responded positively to small coffee machines, single-person sofas and an array of kitchenware customized for those living alone. Jang said the promotion quickly met the sales goal and brought a surprisingly robust revenue that outpaced other theme-based events by a wide margin. Statistics Korea data showed that 23.3 percent of Korean households consist of a single occupant as of 2010, up from 20 percent in 2005 and 12.7 percent in 1995. The figure for the U.S. is 28 percent and the rapid growth of single-person households is witnessed in other major economies. Given that Korea is still under the influence of conservative family values that push singles to get married and have children, the ratio those living alone is increasing more quickly than ever, experts said. 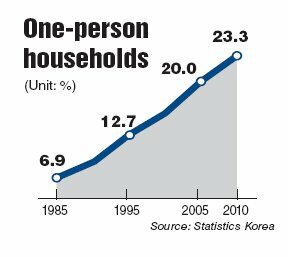 “About one in four households (now) has only one occupant in Korea, which is nothing if not an explosive growth,” said Shin Sang-young, research fellow at Seoul Development Institute. Shin, who authored a report on the one-occupant household in Korea, said the solo population has many subgroups. “Younger people such as students and twentysomething singles who have just got a job make up the biggest proportion, and another major group is the elderly who live alone,” he said. Unlike married couples with children who tend to stay in one area for a relatively long time, singles are likely to cluster in specific regions, depending on the infrastructure, Shin said. Throughout Seoul, college students form solo occupant households, largely because of the lack of campus dormitories. They usually rent homes near their universities, contributing to the clustering of related businesses such as laundry services and small restaurants specializing in affordable food. 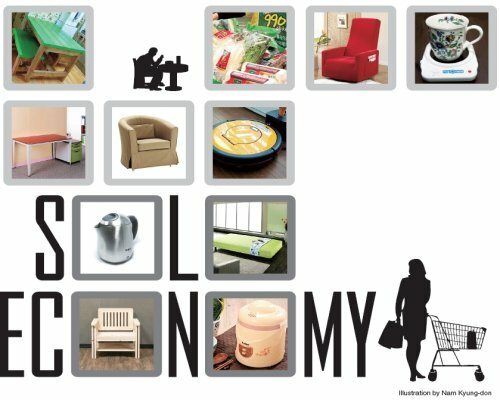 Furniture makers are already soliciting one-person households with more specialized products. While the overall furniture sales remain sluggish, sofas and other furniture sets targeting singles jumped by more than 20 percent over the past two years. Electronics makers are also jumping into the fledging solo market. LG Electronics, for instance, is beefing up its product lineups for one-person households, such as robot vacuum cleaners, miniature air purifiers and small TV sets that double as computer monitors. “As the number of people who live alone is growing, the outlook remains positive for home appliances and electronic gadgets that reflect their lifestyle and needs,” said an official at LG Electronics.